Latest report notes dynamic investment in many sectors during first quarter. Vietnam’s real estate market saw dynamic investment across many segments in the first quarter of 2017, according to the latest report from Savills. One of the most significant deals was the acquisition of a 0.6 ha commercial site in a prime location in Ho Chi Minh City’s CBD by CapitaLand, to build their first international Grade A mixed-use project in Vietnam. The project will receive disbursements from a $500 million fund targeting commercial assets in Vietnam set up by the Singaporean developer in November last year. CapitaLand also announced the acquisition of a 90 per cent stake in a 0.8 ha project in District 2’s Thao Dien, one of the most sought-after residential addresses in Ho Chi Minh City, to develop over 300 residential units. This was in line with its strategy to expand its residential development portfolio in the country. 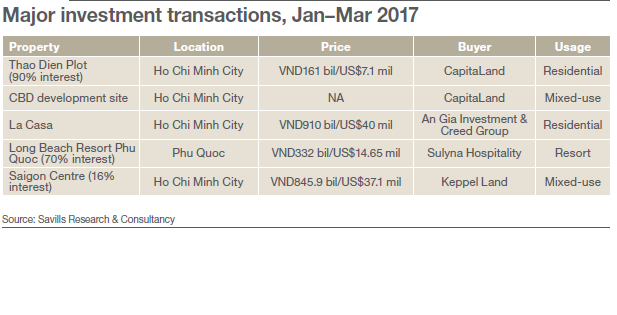 The report also noted that another Singaporean developer, Keppel Land, paid VND846 billion ($37 million) to increase its stake by 16 per cent in its mixed-use Saigon Centre project, located in the heart of Ho Chi Minh City. Among major activities, in March, Hongkong Land became a strategic partner of the HCMC Infrastructure Investment JSC (CII) in the development of residential projects in the locally-listed firm’s land portfolio, including several hectares in the Thu Thiem New Urban Area. In another popular residential area of the city, An Gia Investment and the Creed Group from Japan continued to acquire the remaining five apartment blocks of the La Casa project in District 7 from the Van Phat Hung Group, for VND910 billion ($40 million). In the hospitality sector, the Malaysia-based Berjaya Land has locked in the disposal of its 70 per cent stake in a four-star resort property on Phu Quoc Island to Sulyna Hospitality for a total of $14.65 million. 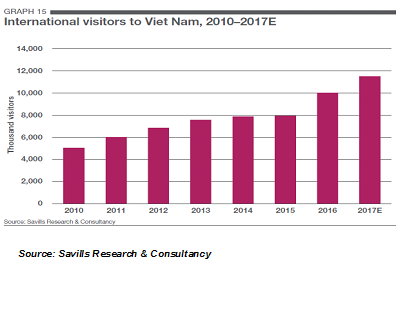 The report said that rapidly rising numbers of tourists in Vietnam are providing a huge boost to the hospitality sector. The tourism sector got off to a positive start this year, with approximately 3.2 million international arrivals in the first quarter, an increase of 29 per cent year-on-year. This follows a record number of tourists, of over 10 million, arriving in 2016, and the country is expected to welcome 11.5 million international tourists this year. Coastal destinations play a key role in drawing in the majority of these visitors from a broad cross-section of source countries. Vietnam is working towards fully harnessing its rich tourism potential in the years to come, as development of the tourism industry has now been made the Number 1 priority of the government.